To make the Southern Reading Challenge even more challenging, Maggie has added a contest. You just pick out a passage which depicts “sense of place” and post a picture to go with it. Easy right? Soon, mother and daughter were sitting at iron tables across from Jackson Square. It was a glorious New Orleans morning. Around the square, artists had set up easels displaying bright watercolor portraits and scenes of the city, painted with agility, technique, and that complete lack of originality so comforting to shoppers who need to fill a space on their wall, but don’t want to be troubled by newfangled art. Or oldfangled art, either. Who doesn’t recognize this landmark right? Here’s another one from Jackson Square. Obviously I wasn’t looking for art but just trying to find out when I’d meet my soulmate. Heh. When were you supposed to meet your soulmate? Your picture at the table is a PreK picture, I assume. There aren’t as many artists and fortune tellers as before. boo hoo. I hope that they can come back soon. Isabel – Yes, definitely way before Hurricane Katrina. I hope they do go back and then I’ll have to visit. That was so much fun. That’s a nice quote, Iliana. And I like the photos! I’m with Kailana though; had you not mentioned it was the St. Louis Cathedral, I would have had no idea. I’m afraid that I am not too familiar with New Orleans. That anonymous comment above was me by the way. I forgot to fill in my name. Sorry, Iliana! This is perfect! I love the idea of that challenge and your words and photograph just go so well together..
Christine – Thanks girl. You should try it. I remember you did something similar with a poem and one of your photos and that was so cool. Love the quote…love the pics! Nice job! Gorgeous pics! Good job capturing the sense of place! Those are great photos. 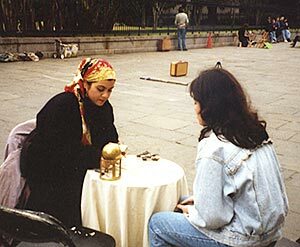 I have always been too scared to have my cards or palm read. I’m not sure why as they probably tell you what they think you want to hear, but I still can’t do it. It looks too cold to be New Orleans–I always think of it being hot and humid. I hadn’t recognized the landmark either. I must say I am having a little bit of trouble with Maggie’s contest, probably because I’m from so far away and have never really set eyes on the South. But that only makes it more interesting, and I’ve been really enjoying everyone else’s entries. Love the quote and pictures, Iliana. 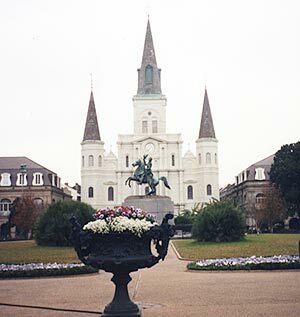 I think of Jackson Square when I hear New Orleans mentioned, too. And the beignets and chicory coffee at Cafe du Monde (yum!). That’s such a great city. Haven’t read any Loraine Despres, but she sounds really funny. Stefanie – Exactly. We just got there a bit early so they weren’t quite set up yet. Danielle – Well, I was there for New Year’s so that’s why I’m wearing a jacket but shhh don’t tell or it won’t go with my quote. ha,ha..
Nymeth – I did cheat a little bit actually because the novel takes place mainly in Gentry, Louisiana. Luckily the characters do go out to New Orleans and that was easy 🙂 Can’t wait to see what you’ll come up with! Kelly – Yay, I knew I couldn’t be the only one who thought that. ha.ha. But now I’m sitting here at my office thinking of beignets. eep! I didn’t recognize it either — glad I’m not alone! But it’s a cool picture, and I like the idea of matching a picture to a book. I felt really bad for not immediately recognizing Jackson Square, but I’m in the minority in my distaste for New Orleans. Friends from my writing group think I’m completely nuts; New Orleans gives me the creeps!! I love your photos. I was wondering about the jacket, myself. January is one of those rare months when N.O. actually cools off, so the jacket makes sense. Whew. I love that you could use your own photos for this contest! Well done! I love that Maggie is having contests within the challenge, don’t you? Dorothy W. – It is pretty fun actually and kind ofmakes you pay attention to little details, both in the book and photograph. Nancy, aka Bookfool – Why does it give you the creeps? I was there for New Year’s and I wouldn’t go back at that time. Too crowded for my taste (obviously, I won’t do Mardi Gras either). I just don’t like big crowds like that. Those definitely give me the creeps! I just finished reading Mary Higgins Clark’s “I Heard That Song Before.” It wasn’t one of her best, but it was very interesting. It showed the possibilities of murder while sleepwalking. READ IT. I don’t know why. Although, it probably helps that it’s such a violent place. When you live nearby, you hear more horror stories. A friend went for Mardi Gras and was knocked unconscious. Also, it may be vibes. I have a friend who is a psychic and she’s the only other person who says her skin crawled the whole time she was in N.O. That’s how I feel.